Dr. Dimitris Argyropoulos, Professor and Finland Distinguished Professor of Chemistry in the Department of Forest Biomaterials, is in the process of creating the company Lumicide with Drs. Reza Ghiladi, Associate Professor in the Department of Chemistry, and Frank Scholle, Associate Professor in the Department of Biological Sciences. The collaborative cross-college project, now in the commercialization stage, is supported by the Chancellor’s Innovation Fund and the North Carolina Biotechnology Center. Lumicide will produce nanofibrillated cellulose material embedded with photosensitive molecules for use as an antimicrobial and antiviral additive. Basically, they will create an additive for an antimicrobial paint activated by air and light. Painted surfaces, like doorknobs, will kill microbes, viruses and fungi on contact. Activated by simply turning on the light, the product is ideal for places like hospitals, cruise ships and home nurseries since the antimicrobial paint is also green and non-toxic. Argyropoulos and the team were inspired by photoactive cancer treatments, which use focused visible light to kill cancer cells. Starting with photo active papers and ideas aimed at medical applications, the team finally landed on the idea of using nanofibrillated cellulose to create their new product. Nanofibrillated cellulose, which is not only durable, but resistant to changes in heat, is made from paper that has been extremely delaminated to create a gel-like substance. After adding an active component, the team realized they were on to something. Their product is 99.5 percent accurate at killing microbes and various viruses through oxidation. The next step for Lumicide is to test durability and effectiveness of the paint before entering clinical trials. It’s important to know how long the paint’s antimicrobial properties will last between coats. 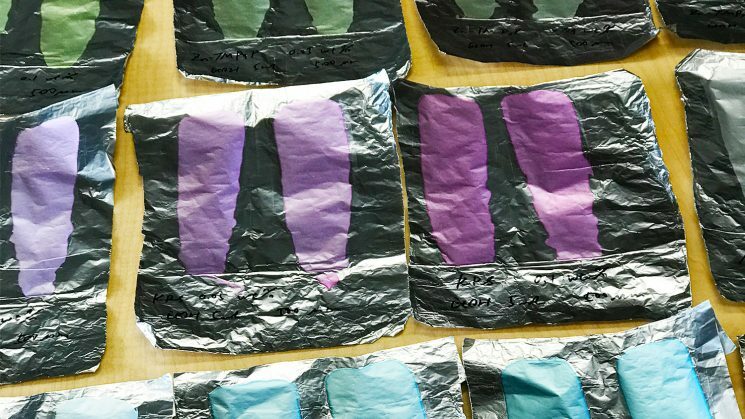 They also hope to test the product in multiple colors and surfaces, including medical devices, clothing, wallpaper, linens, food wrappers and more, to give users more options. To Argyropoulos, the most important aspect of the product is combatting antibiotic resistance. Since the antimicrobial paint will kill microbes without people having to take medicine, doctors won’t have to prescribe as many antibiotics. The paint is less invasive, more effective and prevents the spread of drug-resistant super bugs. The work of the group was also recently featured on CBS North Carolina. Watch the two-minute video. This post was originally published in College of Natural Resources News.